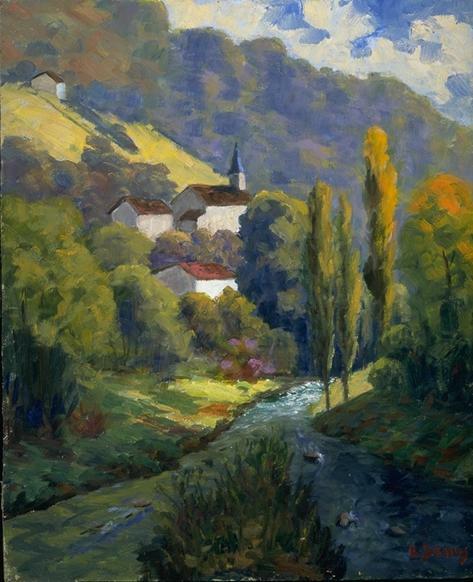 Louis Dewis, who we have already had occasion to discuss since he made Biarritz his home, is a master landscape painter. His works are exhibited in many museums in Europe. This beautiful painter combines the emotions he feels in observing nature, his undoubted skills and a remarkable understanding of his art. We have asked Louis Dewis to reveal to our readers his manner of working. 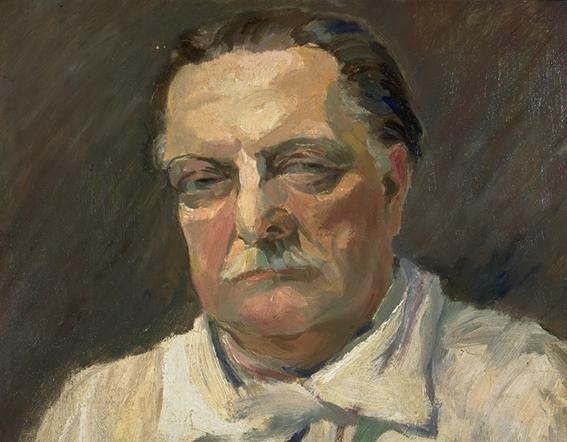 Self-portrait painted at about the time of this interview. For the landscape painter, nature remains the great inspiration and the constant source of emotion, but works about nature (which have been the means and the end for the Impressionists and their disciples) are, in my opinion, nothing more than recordings of the initial impact and allowing its transformation into a work of art. In fact, I make my paintings from my sketches and my studies. They are for me indispensable basic documents from which my visual memory, specially trained and essential for work such as I perform, creates the possibility of evoking once again the glorification of nature brought about by the harmony of colors and the character of the landscape. It is this memory that, transmuted by my sensitivities, gives to my works this life and this truth that you love to find there; life generated by this unconscious gift, something inevitable in works like this; life emanates from the creative process, which remains mysterious, and from the veracity of the character of each landscape, of the atmosphere, through the equilibrium and the harmony of masses and colors, without a concern for details, for I never seek a servile copy of nature. Dewis’ later work at Biarritz provided outstanding examples of his method and philosophy. 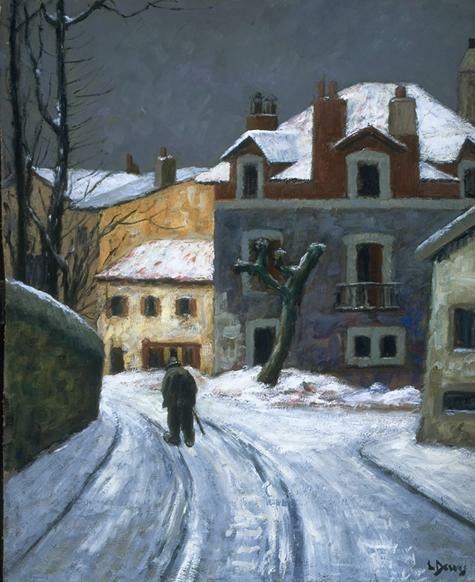 Snow in Biarritz (1942) – depicting a freak snowstorm in the resort city. The Dewis Collection has the original sketch made on rue Peyroloubith, Dewis’ intermediate attempts at interpreting this scene and the final work reproduced above, which was shown at Dewis’ last exhibition at Bayonne’s La Galerie Limonaire in 1945. [N]ot only works of achievement, but little masterpieces of poetry – of the silence of lilting snowflakes. The Village Church (1945) – also shown at Bayonne. The Flemish artist is a remarkable landscape painter. He found in the luminosity of the Basque Country, in the variety of his settings, works to employ the full range of colors in his very rich palette. His nature is luxuriant, his foliage abundant, thick and dense – his torrents full of movement as, like steeds of brilliant white, they gallop through the green turf.